Yes, I was one of those who stayed up all night to watch the Royal Wedding and I had a fantastic time! I set up a little makeshift viewing area in the spare room/my office so I wouldn't disturb J. I used my monitor to stream it live on Hulu, lounging on the bed/couch while munching banana bread and tweeting. -Seeing everybody's excitement on Twitter and around the world. It was such an "It's a Small World" moment to know billions were watching the same as me. 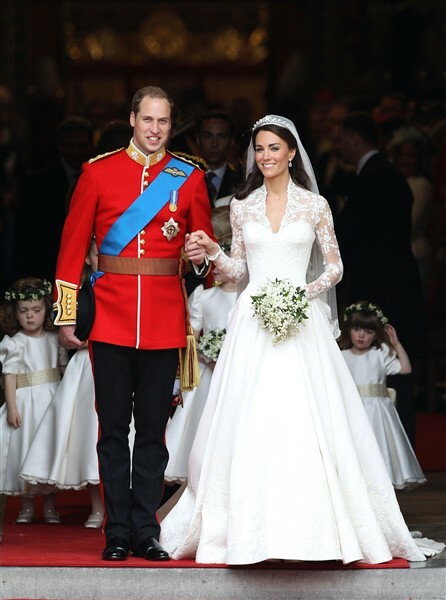 -Kate's dress was absolutely stunning. I loved the classic direction she went in with the lace, the neckline, her veil, and that tiara. 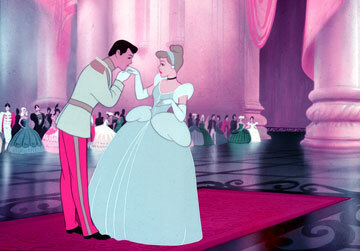 -The princes actually looking like I imagine princes SHOULD look. Sashes, medals, gloves, and all. -Prince Harry sneaking a peek at Kate for William. Easily my favorite moment of the whole affair. 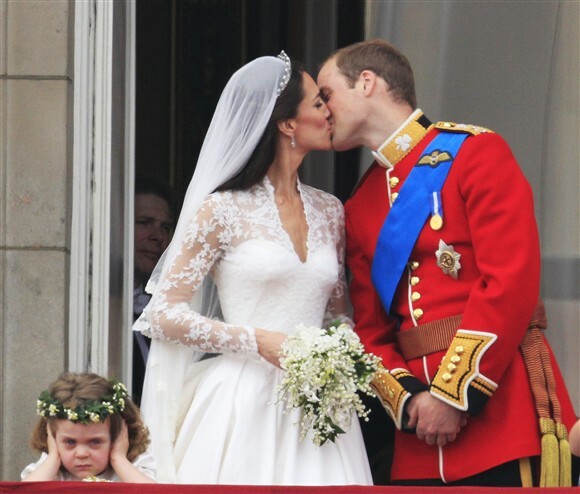 -The little flower girl covering her ears from the roar as William and Kate kissed on the balcony. I imagine my little face would look much the same at that moment, too. -Barbara Walters yapping constantly about inappropriate stuff: Diana's death NON-STOP, funerals, suicide, Harry being better looking than William, William's baldness INCESSANTLY, etc. I found it very disrespectful and tacky, personally. Most of it was gossipy and petty, rather than informative and interesting. She's a news anchor, not a high school cheerleader. Dial it back, Babs. -Why can't William turn around SOONER to see his bride? He didn't get to see her until she was beside him? I feel like he should have gotten to see a full walking-down-the-aisle-towards-him moment for at least a few feet at the end. Did you watch? What were your highlights/criticisms? Yeah I knew you would be watching! Tee hee! I think you would hit me if we watched it together, because 1) I would fall asleep or worse, 2) I would mock everything. Because I'm kind of a wedding hater. 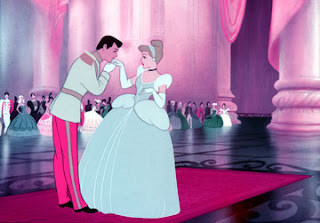 Don't do frillies and princess and romance. Except yours, of course. I would happily, joyfully partake in yours, because you are special like that. I am for definite on Team Harry & I thought him turning & smiling was the cutest thing everrrr. Babawa Wawa is annoying, always. Happy Saturday - finally some nice weather! Hi Christina, LOVE the viewing area. And I loved the wedding too. I was completely caught up in it all. Hope you have a great weekend. I, too, stayed up all night to watch the Royal Wedding along with my mom, sister, niece, and two friends. We made a party of it & wouldn't have missed it for the world. We watched it on BBC America with NO commercials and no petty comments either. So glad you enjoyed it. I really enjoyed 'tweeting' with you from England during the wedding, Christina - it made it even more fun to watch. I felt so sad for William not being able to turn round - it's a weird British tradition - my husband wasn't supposed to turn round to see me coming up the aisle at our wedding either. I did love it when Harry looked and I'd love to know exactly what he said, although it was clearly complimentary! I loved Catherine's dress. 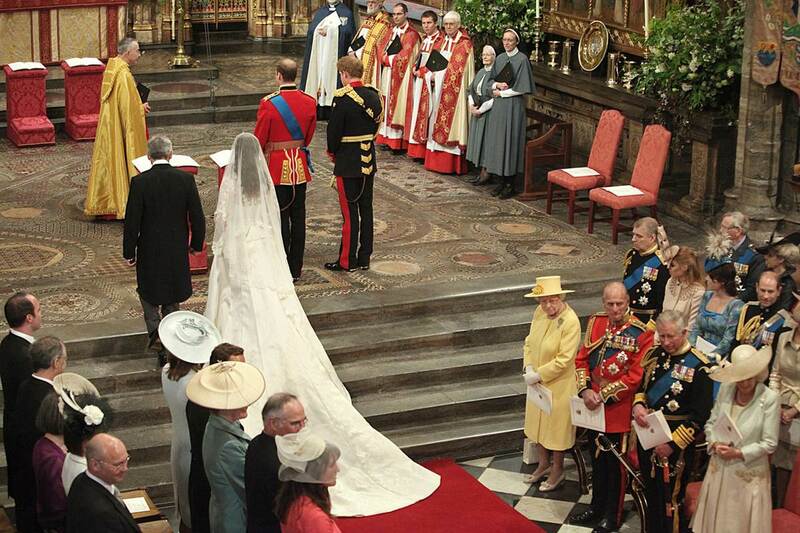 It really was such a wonderful day - I was particularly excited as our florist was involved in doing the flowers at Westminster Abbey & Buckingham Palace - we live very near where Catherine's family do, and she is their florist too! Catherine asked her personally to assist the London florist - so exciting! @Kristina I also loved Will telling her she looked beautiful when she first got up there. His face was just glowing, they both looked so happy at that moment! @Sophia I took a nap between them leaving the church and their balcony appearance. hehe And you would have LOVED being snarky and munching snacks w/ me! @Julie - I was also surprised at how understated her dress was. But I actually liked it, it made it timeless. @April Aww I loved tweeting with you too! So fun! I didn't know it was a British tradition, that makes more sense now. Sooo exciting about the florist!! Eeee! Pepperocini Beef Roast + House Progress!